As Brazil prepare for the first of their two World Cup warm-up friendly against Croatia at Anfield this weekend, Seleção coach Tite will look to fine tune his squad ahead of their opening match against Switzerland on June 17 th . Brazil ramp up preparations when they travel to Vienna to play Austria next weekend. These friendlies have clearly been organised with Brazil’s group opponents- Switzerland, Costa Rica and Serbia- in mind. Many questions will be racing through Tite’s mind as June 17 th approaches, but these are likely to be his three biggest priorities for friendlies on Merseyside and Vienna. At left-back, Tite has an embarrassment of riches at his disposal. Marcelo and Filipe Luis are in the squad for Russia, but Juventus’ Alex Sandro would start for most of the top nations. For Brazil, he cannot even get into the squad. The same however, is not true at right-back. So Dani Alves’ knee injury on the eve of the tournament carries an extra headache for Tite. Fágner of Corinthians and Danilo of Manchester City have been called up in his stead. It is not clear yet which will start in Russia. Most likely Danilo, but in truth, they are Alves replacements in name only. The PSG full-back can justifiably claim to be one of the all time greats in his position. He is especially important when Philippe Coutinho plays on the right hand side of the attack. Coutinho is given license to wander in-field and Alves’ support line running takes on extra importance. His reputation was honed at Barcelona as Messi’s wing man. There can be few right-backs capable of playing this role with such distinction. At 34, Tite was going to have to broach the subject of replacing Alves in the long-term sooner or later, but he would like to have used the period of adjournment from competitive CONMEBOL action this autumn to figure that out. Fágner and Danilo are capable, if unspectacular choices. But neither have the engine, or attacking thrust Alves provides. Willian might be an immediate beneficiary of Alves’ demise. Tite could decide that he needs a more energetic, line-hugging type on the right wing without his principal right full-back. Tite needs to work out who his new horse is and how it alters the dynamic of the team. Show your passion for the Brazilian National Team with online betting. Neymar’s metatarsal injury means he has not played since late February. Had the injury occurred a couple of weeks later his participation in the World Cup would have come under serious threat. As it happens, his recuperation exactly lines up with Tite’s preparation plans. However, training ground fitness and match fitness are two different things. On the face of it, Neymar has had three months of light duties in the build-up to the tournament. But getting his match intensity back will be a huge challenge for the Seleção’s fitness staff. Neymar will be close to four months without a competitive game by the time they kick-off against Switzerland in Rostov. Tite will probably reason that his star turn can ease himself into top gear during the group stages ready for the knockout phase- though he can’t take what are likely to be stubborn opponents for granted. Brazil were able to beat Germany in Berlin back in March without Neymar, but this was a performance heavily focused on defensive discipline. 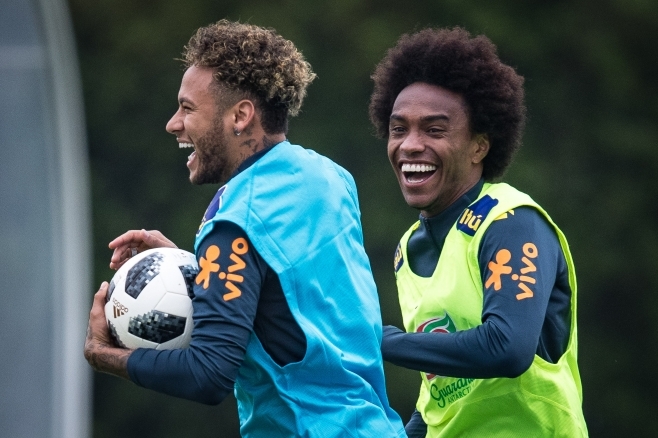 In the group stage, Brazil will need attacking spark against teams likely to try and frustrate them and while Tite has reduced the “Neymar-dependência” so typical of Dunga’s reign, he will still need his star player to cut an influential figure starting on June 17 th . Since qualification was secured, Tite has been working on two functional iterations of his midfield. Against stubborn, defensive opposition, he has dropped Philippe Coutinho into the midfield 3 with Casemiro and Paulinho, allowing Willian to provide the threat from wide right. Coutinho’s creative abilities are then utilised in slightly deeper positions and Willian is able to keep the pitch nice and big. For sterner tests, Coutinho moves to the right side of attack, with Renato Augusto operating as the de facto number 8, connecting play between Casemiro and allowing the likes of Paulinho, Neymar and Coutinho freedom to drift. Having played under Tite at club level, Renato has an acute understanding of how to play the ‘polyfilla’ role and keep the ball moving. However, Renato did not feature in the March friendlies as the Chinese Superleague season had only just started and he lacked match sharpness. Tite seems keen to squeeze Fernandinho into the team ahead of the Beijing Gouan midfielder. Renato Augusto is currently struggling with a knee inflammation, which gives Tite the excuse to settle Fernandinho into his role. Ferna is certainly a superior player, but Augusto has a much better appreciation of Tite’s system. At City, Fernandinho sits and allows de Bruyne and Silva freedom to roam. But Casemiro has that job in the Brazil shirt, with Paulinho afforded license to make late runs into the area. The number 8 role in Tite’s midfield is a little more complex, where Augusto has become incredibly adept at filling all of the gaps left by players such as Neymar, Coutinho and even the full-backs, who often abandon their posts. Tite will have to make a decision between Fernandinho and Renato Augusto during these two friendlies. If Ferna can learn the role that Augusto has mastered, he can expect to be handed the shirt for Brazil’s knockout fixtures (assuming they progress from their group). Otherwise, Renato Augusto, such an underrated component of Tite’s fine-tuned system, will be charged with keeping the engine purring under the Seleção bonnet.